DraftKings, based out of Boston, Massachusetts, USA, is one of the very top daily fantasy sports (DFS) sites in the industry. DraftKings’ mammoth growth in recent years now has the site paying out cash to players exceeding $1 Billion in just 2015 alone! Their massive growth and constant adding of affiliations with professional sports leagues and organizations has them now offering more various sports (currently 9) than any other site out there. National Football League (NFL), Major League Baseball (MLB), National Basketball Association (NBA), National Hockey League (NHL), Canadian Football League (CFL), Golf (PGA), Soccer, (SOC), NASCAR (NAS), and Mixed Martial Arts (MMA). DraftKings offers a huge selection of contest types to play in for all the aforementioned sports, with contest entry fees ranging from $0.25 to over $5,000. DraftKings also offers freerolls to win tickets for contests or DraftKings dollars that can be used to enter cash contests. With year-round sports offerings, massive cash payouts occur every week in the millions, and it constantly continues to increase! 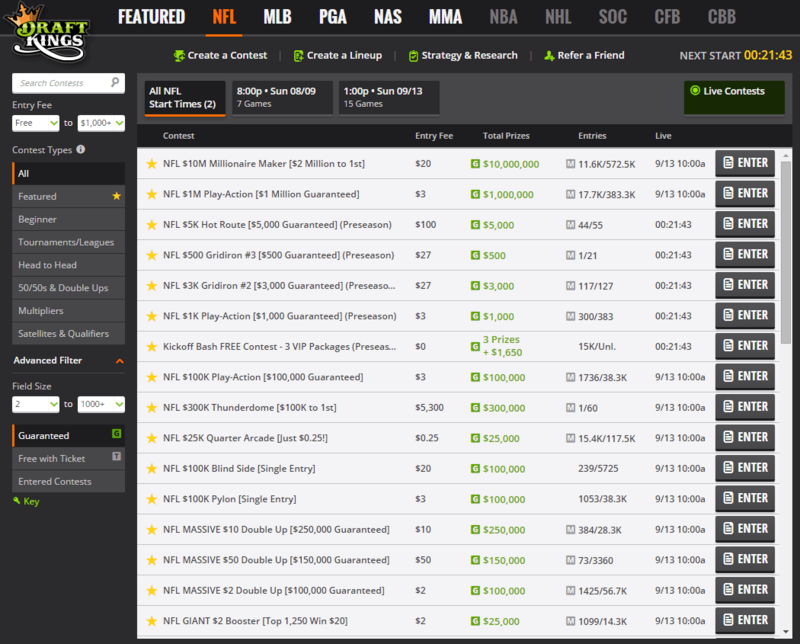 DraftKings has all your sports covered so don’t miss out during your favorite sports seasons! All new customers to DraftKings will receive a free entry into a real money contest. The free entry is worth $3 and will provide entry into one of the big guaranteed prize pool tournaments that DraftKings regularly offers. The sport will depend on the time of year. You must register an account and make a deposit of at least $5 to qualify for the free entry coupon. 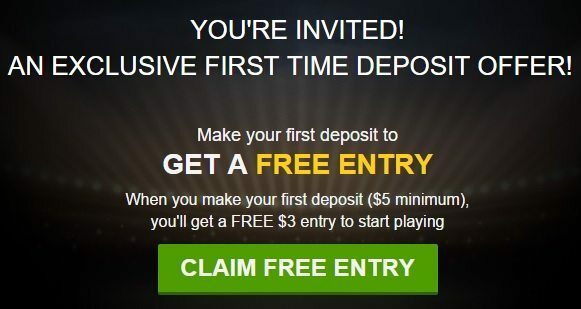 After your DraftKings account has been created, you have the option to deposit cash into your newly registered account. You can make cash deposits using credit/debit cards including Visa, MasterCard, American Express, and Discover, or you can also do this by using PayPal. Click this link to learn more about this DraftKings new player bonus. Everything you could possibly need to do can be done from the DraftKings main lobby. From here you can create a lineup. Simply click on the “Create a Lineup” link, select your available sport and a start time, then click on the continue button which will take you to the draft page. 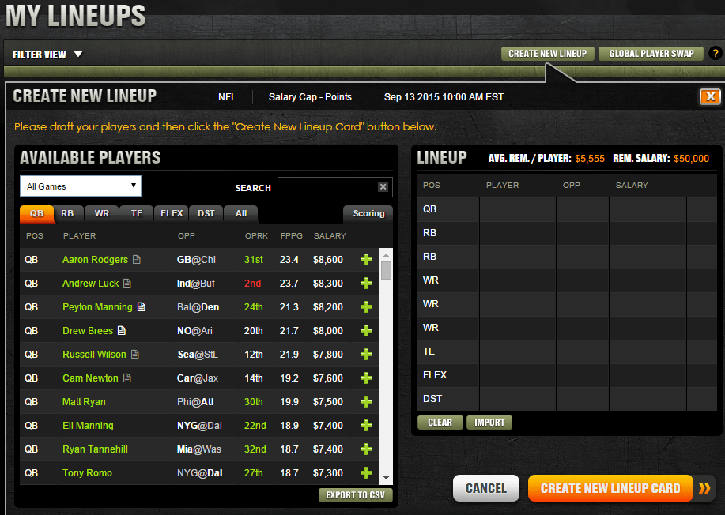 DraftKings has a salary cap amount of $50,000 to spend to fill your lineups. All spots must be filled and the total amount of your lineup cannot exceed the salary cap of $50,000. 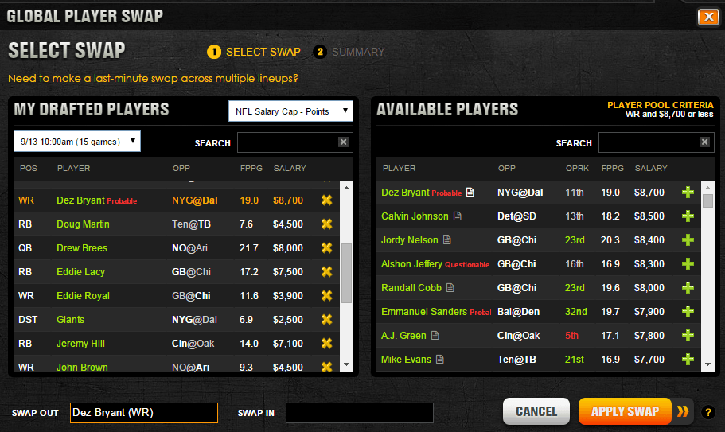 For example, in creating an NFL lineup, DraftKings lists each position and player available. The draft page will also show the opponent matchup, the opponent’s rank vs. that particular position, the average fantasy points per game, and the player’s salary amount. Injury information, current player news, game logs, and opponent matchup information is also available here by clicking on the link for a particular player. Once you have filled all the roster spots at or under the salary cap, click the “Create New Lineup” button, and your lineup is saved. You can create as many lineups as you want in this same manner. Once your lineups are created, you can select any contest from the lobby and import your saved lineups into that contest, and then you are in action! DraftKings offers a “Late Player Swap” feature as well as a global player swap option. The Late Player Swap feature allows you to swap out and replace any roster spot before that players game time has started, even if other players games in your lineup has already started. This feature will come in handy to adjust for last minute non-starts for any reason. The global player swap feature allows you to swap out a particular player and replace him in all your lineups. For example, say you have 10 different lineups, with QB Andrew Luck in 7 of them. Say you want to replace him with someone else in all your lineups. Using this feature, you could swap him out and replace him with another player in all your lineups at the same time. As well as creating lineups, you can also create your own contests very much like the contests you may see in the lobby. You will also have the options to make your created contests either public (available to everyone) or private (by your invitation only). DraftKings offers a wide variety of contest types from which to choose from. Tournaments and leagues are the most popular type of contest with the most players and the biggest offered cash prizes. Guaranteed prize pool (GPP) tournaments have the largest cash prize payouts with cash prize structures guaranteed to pay out to winners, regardless if these contests fill to capacity. Leagues may not be guaranteed if these contests do not fill completely and will cancel if that is the case. The variety of league contest types may vary greatly, depending on the number of entries and entry fee amounts. These particular options can be filtered specifically to narrow down what type of contests you are looking for. This is just two entries at whatever entry fee amount works for you. It’s just you versus another player with the winner taking all (less the 10% rake). Rakes are generally 10% for all contest types but may be less for higher stake entries. These two contest types are very similar. You win 50/50sby scoring in the top half of all entrants, thereby doubling your entry fee (less the rake). Double ups pay 2X your entry fee if you win, but you will need to score slightly higher than 50% of the field. This is another way the site covers the rake. Multiplier contests have various prize payout structures depending on what multiplier you are playing. For example, triple ups pay three times (3X) the entry fees to winners, or 5X, 10X, or whatever multiplier you happen to choose. Satellite and qualifier contests pay winners entry tickets to bigger contests if you win instead of cash. Some tournaments are qualifier entry only, meaning you cannot buy-in into the large GPP contests without winning one of these firsts. Other scenarios include winning these tickets to avoid paying the larger entry fees to the larger GPPs. 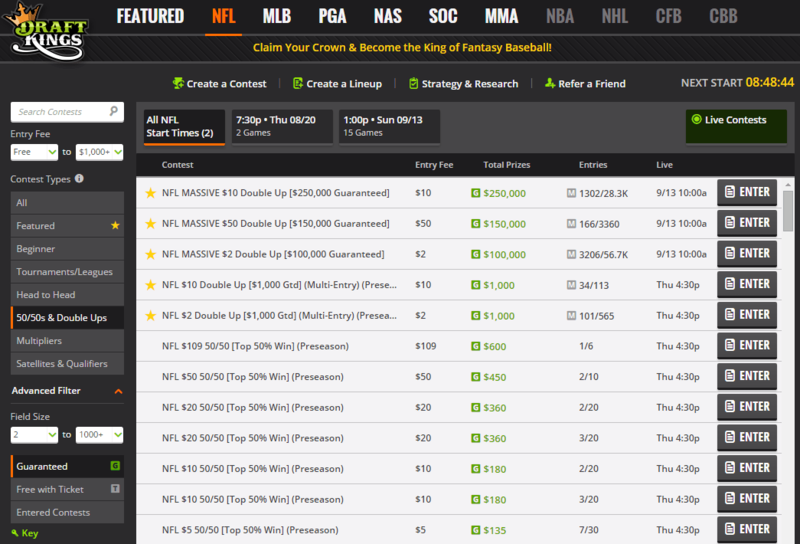 DraftKings offers freerolls either daily or weekly depending on the sport. Winners of freerolls can either win tickets to enter cash contests or DraftKings dollars. 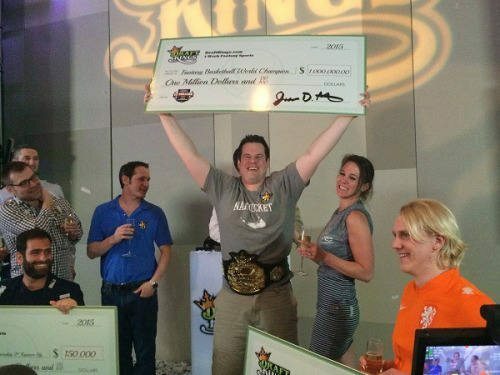 DraftKings dollars cannot be withdrawn, but can be used to enter cash contests, similar to the tickets. 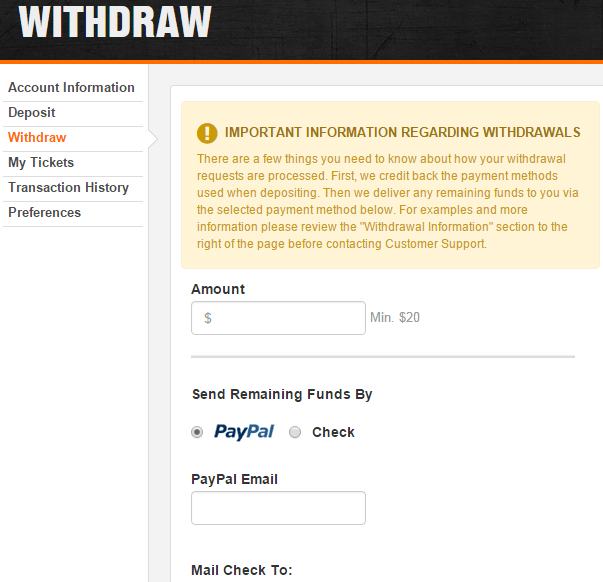 Withdrawing your cash from DraftKings is very simple. Just click on the My Account link in the upper right-hand corner, then select withdraw. Withdrawals must be at least $20 per transaction. DraftKings’ policy is to pay your initial withdrawal amounts back to the original source of your deposit. Any withdrawals exceeding your original deposit amount will be paid to your PayPal account or by check. For example, if you initially deposited $600 using a Visa credit card, the first $600 you withdraw will be credited back to this same Visa card used for the original deposit. Any withdrawals above your original deposit amount will now be paid to you by check or PayPal. You may receive a 1099-Misc federal tax form from DraftKings if you receive a cumulative net profit exceeding $600 in a calendar year. If this is the case, you will need to submit your Social Security Number (SSN) for them to process this. 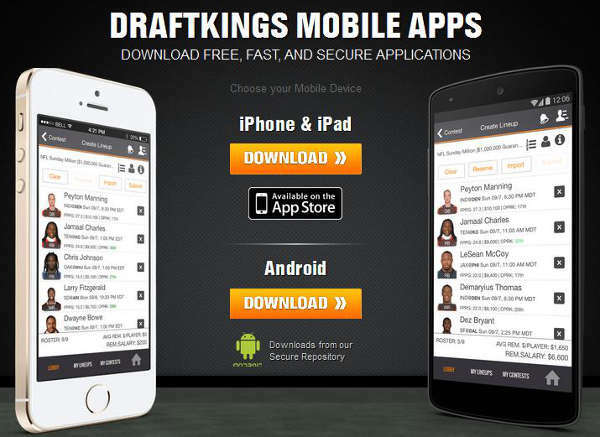 Check out our DraftKings App and Mobile Site review here. DraftKings support is outstanding and very quick to respond. Our response times to questions/issues have ranged anywhere from 2 minutes to several hours later. Support can be accessed from the same My Account section for deposits/withdrawals. Simply click on the “Contact Us” link, and send your question/request. 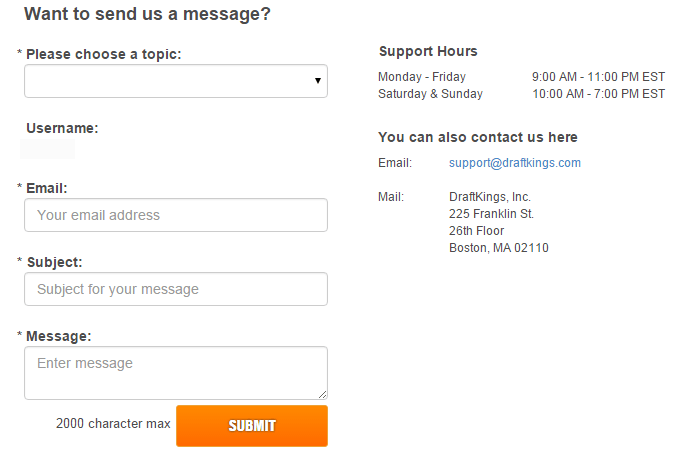 DraftKings support is available seven days/week. You do not need to be logged in on the site to contact them. You can email them at support@draftkings.com as well. Just be sure to use your email address that you have on your account with DraftKings. Find out if Draft Kings is legit! Read the Draft Kings review at LegitOrScam.org. Don’t know how to play fantasy football? Find complete instructions on how to play fantasy football here! Do you also enjoy sports betting? Visit BettingSitesUSA.net for the best online sportsbooks available to USA players. Redeem the BetOnline promotional code for additional benefits available to all new players. If you’d like to read more about DraftKings, we recommend checking out the extensive review at Fantasy Footballers. Share your DraftKings experiences and submit your own review!